Enough about the whisky – let the walking begin. And what a beginning! 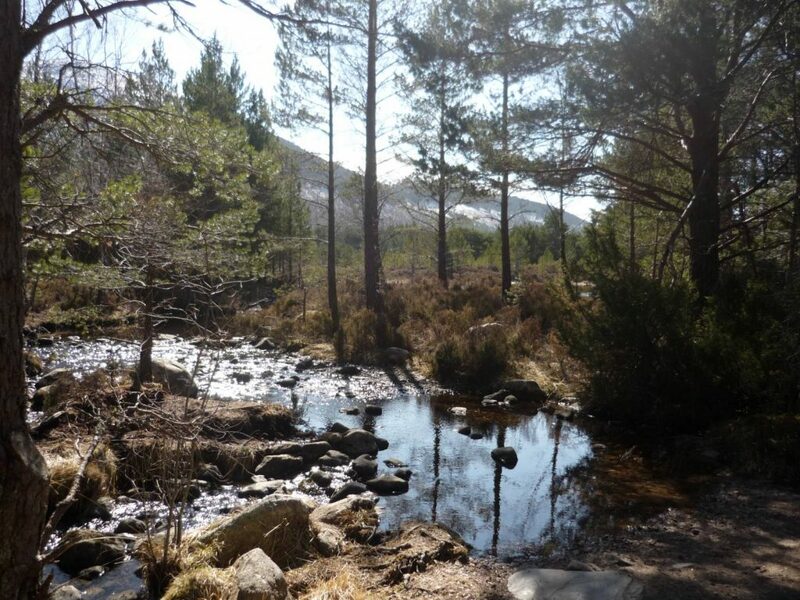 After months of grey dreary weather and freezing cold ( -7 the previous night), the sun shone on this third day of April and showed the Cairngorms in all their glory – blue sky, blue lochs, snow-capped mountains – real picture postcard stuff. I’d come prepared for some chilly temperatures, but this was tropical. Off came my gloves, my downfill, my T-shirt, till I was walking along in my base layer (no, I still had my trousers on…). But I wasn’t so easily fooled – snow clung in the hollows by the loch and that east wind was lurking in the shadows like a surly adolescent hanging about on a street corner. 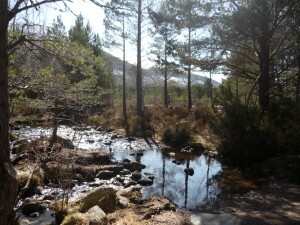 This was a gentle 10 mile introduction – a circular route round Loch an Eilean and the Rothiemurchus estate, through moorland and woods. 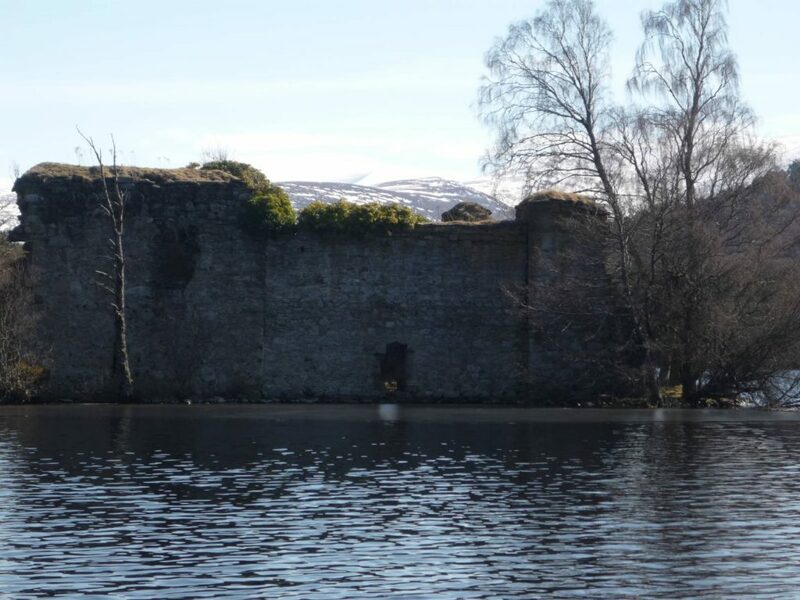 Of course I had to take a picture of the very photogenic ancient castle in the middle of the loch. A woman with a small boy was standing on the shore doing the same. “Funny place for a castle,” I said. “Wonder how they got over to it?” I was thinking of English moats and drawbridges. “Boat of course”, said the boy, looking at me as if I wasn’t quite firing on all cylinders. “I ‘spect they just thought it was a nice place,” he answered, stating the blindingly obvious (to a six-year old). But he was right – it was a nice place to put your fortified home, and you’d never go short for a fish supper. The lake still had a thin sheet of ice on it and the meandering track followed the shore for a long way. 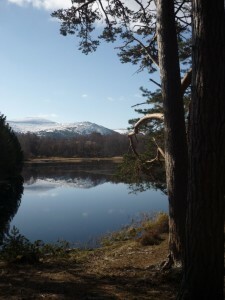 But for me the best part of the walk was when the trail led away from the loch eastwards along more solitary tracks to give clearer views of those dazzling mountains.